Explore the galaxy and carve out your own destiny in a 3D MMORPG. This truly cross-platform game enables thousands of players to interact as the pilots of spaceships in a vast online universe. Players may build their characters in any direction they desire, becoming rich captains of industry, military heroes, or outlaws. A fast-paced, realtime "twitch" style combat model gives intense action, coupled with the backdrop of RPG gameplay in a massive online galaxy. Three major player factions form a delicate balance of power, with several NPC sub-factions creating situations of economic struggle, political intrigue and conflict. The completely persistent universe and detailed storyline add to the depth of immersion, resulting in a unique online experience. Support for multiple platforms across desktop and mobile, all of which play together in a single unified game world. Pilots may seamlessly switch from one platform to another. 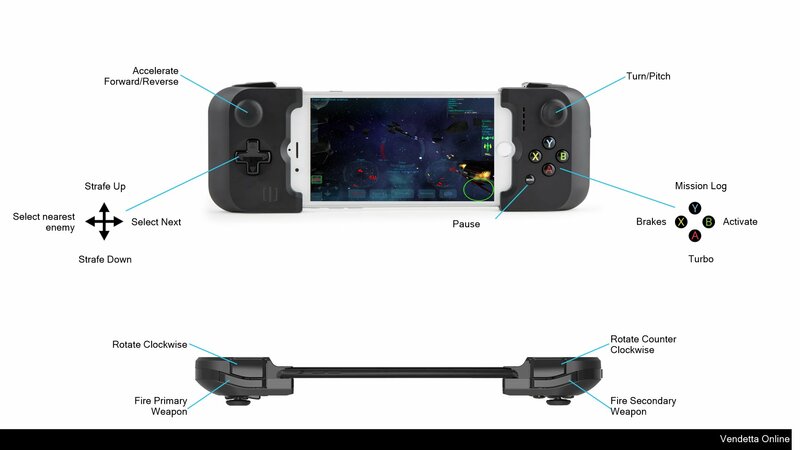 The game supports Extended (dual-analog) MFi game controllers, and features cross-platform voice chat, as well as voice-recognition text chat for hands-free typing, text-to-speech for reading mission and other game updates, and many other features. Although the game can be played quite casually, this is a "real" PC-grade MMORPG, and is not a watered-down "mobile" game experience. Our native iOS version has exactly the same capabilities as the PC versions, with a different interface. This is a very hardware-intensive game, and we recommend closing all background applications on your device to get the best performance. Vendetta Online is about a 400MB download, but could use about 800MB on your device. The game is updated frequently, usually every week or two, with the developers and userbase actively discussing the future of the game on the Vendetta Online forums. Some users even choose to become directly involved, joining the volunteer "Player Contribution Corps" and creating new missions to tell stories of their own. Many frequent updates are server-side and will not result in a visible "iOS app" update. 1) Free, where you pay no money at all, and may earn "Crystal" currency through your gameplay, and spend it on certain higher-end ships and equipment. You are limited to only playing on mobile, and are eventually level capped. Note: Despite the level cap, this is not a "pay to win" scenario, as individual player skill far outweighs the benefits of purchasable equipment. Reaching the level cap takes quite awhile, and you may continue to play indefinitely after reaching it. 2) Lite, where you basically subscribe for $1/month, gain the ability to earn 50% more crystal per day, and may now use your same characters and account to play on your Mac. 3) Premium, where you no longer require "Crystal" currency, or even see it, and you only play the game itself the way it was originally intended. There are no level caps of any kind, and you can play on any platform. You may create in-game guilds, manufacture capital ships, and other large endgame goals. Lite and Premium levels are available via In App Purchase, as well as blocks of Crystal. If you have any problems or concerns, please contact us via email, or (preferred) by creating a Support Ticket on vendetta-online.com (more secure, and it proves the account in question is yours). We are a small indie developer, but we respond quickly. Leaving reviews is not a very effective way to reach us about problems.